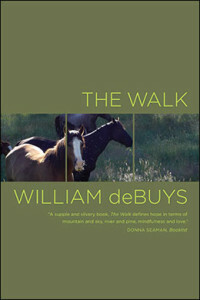 In THE WALK, William deBuys writes about personal loss and the power of the landscape to nurture the recovery of hope. The book consists of three interrelated essays that move from a period of strife in the author’s life to a kind of limbo and eventually to a place of peace. The setting is deBuys’ small farm in New Mexico’s Sangre de Cristo Mountains. Each morning, he takes the same walk through the woods, arriving, as he describes in the first essay, at a clarity that comes from looking at the same vantage point for years. The middle essay, “Geranium,” takes its name from a mare deBuys had to put down, and whose remains become one with the forest. In the final essay, deBuys reflects on drought, the loss of a friend, and the resurgence of land and hope. Contemplative, compassionate, and quietly humorous, THE WALK is nature writing at its finest.